Ask yourself what you think it means when a position is advertised as a secondment? Do you think it means that if you get the job, your existing substantive post will be kept (perhaps back-filled temporarily) for when your secondment completes? If you think yes then you need to go on a training course on the language of Dundee City Council HR and Staffing sections. It has been revealed that staff in DCC are being told posts are open to secondment, applying for them in good faith and being successful at interview, only to be handed secondment papers, at the point of accepting the appointment, that say something like "we cannot guarantee you a post at the same grade on your return and will offer 1 year cash conservation, should this be the case". DCC HR have thus far failed to respond to Unison questions over this practice. Our advice to members therefore has to be, if Dundee City Council offer a post as "secondment" opportunity, just smile politely, perhaps offer a rueful shake of the head, and walk away. A vital local public health service faces being torn apart by selfish, short-sighted budget decisions. Cuts hidden away in the budgets of a number of local councils has left a vital public health service fighting for its life. Tayside Scientific Services had been a shared service between Dundee City, Angus and Perth & Kinross Councils. It provides chemical and biological testing and analysis to public and private bodies across the region. Fife was also a major customer. Other councils had recently withdrawn from partnership to become customers only, leaving DCC carrying responsibility for the staff and, building and equipment. This year’s budget rounds has seen contributions to that service shredded. Dundee City only offered a flat cash budget going forward, despite clear cost pressures making that a real terms cut of more than 5%. Angus has cut from £256k to just £100k and Perth and Kinross has completely cut its previous £190k contribution. Overall this sees funding for the service cut by £372k to just £526k per year starting next month before any cost pressures are applied. With unavoidable commitments to building and plant costs, this over 40% cut will have a devastating impact on the staffing of the service and could jeopardise its very existence. Dundee City Council has been left trying to salvage something from the ruins of these selfish political decisions. It appears no task force has as yet been set up to rescue this service or the jobs of those who provide it. 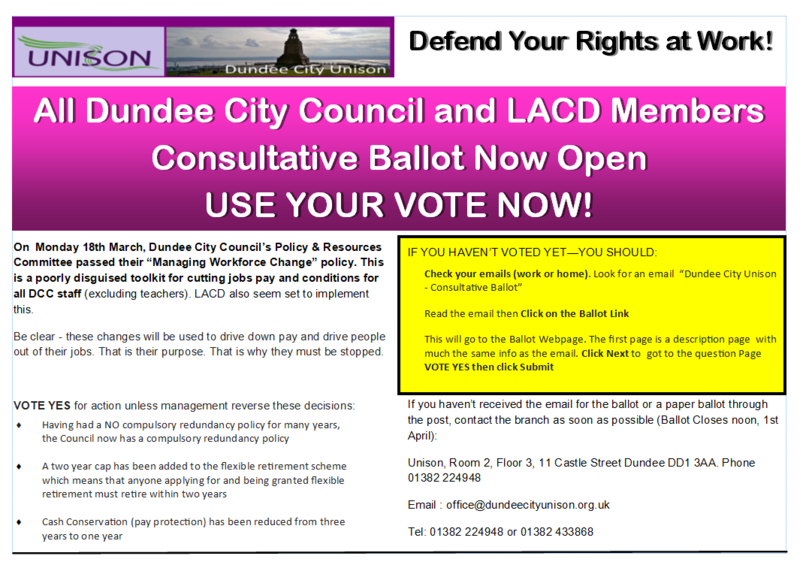 The staff concerned will face the tender mercies of Dundee City’s new “Managing Workforce Change” policy (see coverage of that elsewhere). Despite the genuine sympathy of the senior manager sent to inform the staff yesterday, who has promised to look at TUPE protection etc, DCC's lack of commitment to avoiding redundancies was demonstrated by the fact no-one was there from HR to explain what plans they had to maintain their employment. This is only to be expected from an employer that is cutting pay protection while claiming it will do its best to look at redeployment to avoid actual loss, having shown itself completely incapable of doing so in the past over longer periods of protection. Unison will continue to fight for the best outcome for its members caught in the middle of this mess. The politicians across the local councils should hang their heads in shame for their selfish short sighted decisions that have threatened the continuation of what is a vital public service. Other employees of local councils should take note. We cannot simply wait to see where the axe will fall next. Last night the above policy was heard at the Policy & Resources Committee. All 14 SNP Councillors and the Lord Provost voted in favour of this policy being introduced. Force those seeking flexible retirement to agree to go after 2 years. This is a direct attack on our terms and conditions and sets us up for further sweeping attacks. Thursday’s budget setting meeting will look to pass a further report on commencing negotiations on other terms and conditions we currently have. We weren’t consulted on last night’s paper, there is little chance that consultation will be any better on the next one. Be sure, these changes will affect you and I in the future. UNISON will not stand by and watch our terms and conditions be eradicated by handing the employer the power and tools to do so. You have the power to stop this. Last year saw big victories for staff at West Dumbartonshire and Glasgow’s Equal pay strikers who struck decisively and won. The fight has to start here. We will be going to consultative ballot shortly to allow your voice to be heard. This is it – show the employer we are up for this fight. The employer or the 15 elected members clearly only see you and I as just another cost to be reduced. UNISON disagrees. Let us show them we will not simply accept this. Come along to the AGM. Make sure you have the chance to have your say and prepare for action.